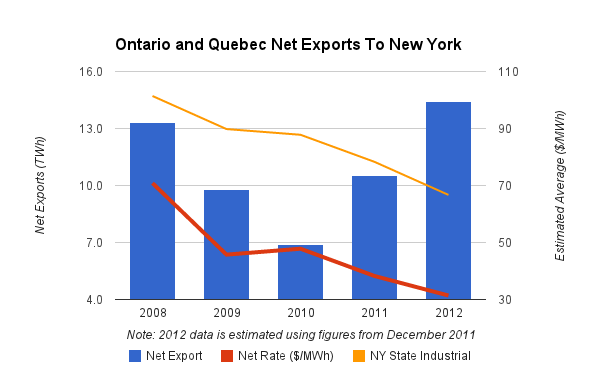 A new study from the Montreal Economic Institute looks at costs of supply, and market value, in Quebec and appears to come ot many of the same conclusions I have reached for Ontario. MONTREAL, June 17, 2013 /CNW Telbec/ - Invoking "obvious economic reasons," i.e., annual savings of $24 million, the Quebec government cancelled six small hydroelectric power projects this past February. In April, however, it announced new supply contracts for wind power, a sector that is already guaranteed to receive an implicit subsidy of $695 million a year until 2020. For Youri Chassin, economist at the MEI and the author of the Economic Note released today, we have an urgent need for rational decisions based on our actual energy requirements and not on artificial support of various energy sectors. With Quebecers having to consume energy that is very expensive to produce, Hydro-Québec is in a position to export more hydroelectricity, a type of energy that is green, renewable and inexpensive, which increasingly benefits Americans, concludes Mr. Chassin. I have read Chassin's paper (available here http://www.iedm.org/files/note0613_fr.pdf) and his numbers just don't make any sense. For your information, I've created a table with the cost of post-heritage pool electricity for 2013, found in an HQ filing with the Régie de l'énergie, in August 2012. Extending these numbers up to 2020 would require more analysis but at first glance, the numbers publicly available debunk Chassin's claim. Obviously, HQ buys post-heritage power it doesn't need (wasting 3.5 TWh of cheap heritage power in 2013), but for the numbers in Chassin's figure to work, it would mean every MWh of post-heritage energy bought above $0 is an "implied subsidy". On the $1,036 M that will be spent on post-heritage pool electricity in 2013, $271 M is used to buy 4.4 TWh of large hydro power from... Hydro-Québec Production, approximately $150 M pays the mothballing of the TCE gas plant (the exact figure is redacted). The rest pays for 6.4 TWh of biomass, wind and small hydro from IPPs (~$540 M + 32 M paid to HQP for wind load balancing) and short term purchases of energy and capacity on the neighboring markets (0.7 TWh, $46 M). So, between the $60 paid to HQP and the $85-90 paid to IPPs, the implied subsidy, if you want to call it that way, would be around $160-175 M, a far cry from the numbers cited above. Thank you for the comment Claude. I winced when I read it of course ; using the word "subsidy" I've often found hunelpful and yet I see I did so, once again, rather stupidly in the headline. I have not read the study (I appreciate the link), but the news release qualified the term with "implicit" - still perhaps unhelpful, but my understanding of what the study is doing is quantifying the cost to HQ's domestic ratepayers of spending on supply during a time of excessive supply. If you do A (contract this supply) the ratepayer impact is B (which would seem to be how the term "implicit subsidy" is used). From the two references I read, the study looks at the additional costs of the wind generation (I assume transmission and balancing), which is right, and it does look at revenues received on both the new and now devalued existing exports (which is, in my opinion, also correct). Whatever the ratepayer impact is, it is plausible it exceeds the full payment of contracts. In fact, one implication of the economic behaviour displayed in a recent post on my original content blog, "The diminishing value, and increasing costs, of wind and solar generation in Ontario", the "implicit subsidy" must rise disproportionately as supply is added, unless the supply cost decreases significantly faster than the supply value. Not only is the new supply of little value, it devalues all the existing supply too. The concept "implicit subsidy" is used in my Economic Note to caracterize a transfer between Hydro-Quebec's clients and energy producers. This transfer is a direct result of government's decisions regarding the new production of electricity. For wind power, the cost of 14,14¢/kWh is way above the average sell price of 5,76¢/kWh. Losing about 8,38¢ each time a kWh is sold doesn't make any economic sense. On a average year (for 2013 to 2020), it hence represents an implicit subsidy of $695 millions. I did work through that with the help of Google translation, and I'll make just a couple of comments. I think there is a difficulty in communicating an "implicit subsidy" is greater then the selling price ... but I've done it often and it is almost certainly true that the cost to the end consumer of wind production in Quebec is greater than the price paid to the generator. I've attached an image from a recent OECD/NEA study on the system costs of different low-carbon technologies ( http://www.oecd-nea.org/ndd/reports/2012/system-effects-exec-sum.pdf ); the costs vary by region, but there's certainly nothing out of the ordinary in this study's numbers. I have often, on my morecoldair.blogspot.ca blog, referred to payments to natural gas generating stations as subsidies. I am less inclined to see these agreements relating to subsidies now than I have ever been. They are payments for capacity - in QC's case, the payments to TCL are payments for capacity that once contracted, almost immediiately ceased to be necessary. That seems more mistake than subsidy. The separation of energy and capacity markets is an important topic - but not one for comments section on a blog. However, the fact is much of Quebec's hydro would have value on a capacity market, and wind would not - so using the average annual price to calculate the "implicit subsidy" would underestimate the implicit subsidy. "All of these calculations is the best available estimate of the implicit subsidies to different sectors. It is still only an estimate, relatively conservative at that. The actual data are not apparent since government decisions do not evaluate when choosing a pathway at the expense of another. The government may, however, choose to evaluate more precisely." That indicates for Quebec what Ontario's auditor general concluded here: there is no apparent business plan that lead to the contracts.